Move aside contouring, strobing is the newest trend to be taking the beauty world by storm. When strobing first stepped onto the scene I wondered what exactly strobing was and why is was casting a shadow over my beloved contouring! After a little investigating I discovered that strobing is basically just a fancy phrase for highlighting the areas of the face that the sun hit naturally in order to bring out your features. So, when you're strobing you basically just want to be highlighting, but to the extreme. Don't be afraid to layer your highlighters to create your desired level of radiance. Let's be honest, it doesn't particularly sound like anything new to me but that being said, I don't believe there's anything wrong with that! Strobing/highlighting definitely deserves to be put on a pedestal every now and again because who doesn't love a radiant glow that lights up and lifts the natural shape of the face. How can I make a post without strobing without mentioning this absolute beauty? MAC's Strobe Cream has been a favourite of mine for a long time now and for good reason; it's a must have accessory for any highlight fiend. The cream has a perfect texture for quick and hassle free application as it isn't so liquidy you'll risk making a mess, but at the same time it isn't so dense its impossible to blend, it's somewhere in between which is absolutely ideal. To strobe using this gorgeous product, I simply pat this onto the tops of my cheekbones, cupids bow and end of my nose to heighten those points. If there's anything to love more than a palette it's an amazing value for money palette. Makeup Revolution is a brand that continues to surprise me with its beautiful products; each one I try lifts the brand higher in my estimations. Their highlight palette consists of three highlighting shades; all of which are perfect for creating on point strobing. In the palette you have a gold toned, pink toned and purple toned highlighter so you're spoilt for choice of which you want to compliment the rest of your makeup of the day. My most used is the gold toned as it gives a gorgeous, champange coloured glow. The name says it all really. This beauty from Topshop is small but mighty as it does pack a hella gorgeous glow. Like Strobe Cream it is in cream form but has a slightly more dense, mousse texture to it. I find cream highlights underneath powder ones are the best technique for achieving that ultimate strobed look as the cream creates a base for the powder to stay longer and also emphasizes the shade of the powder. 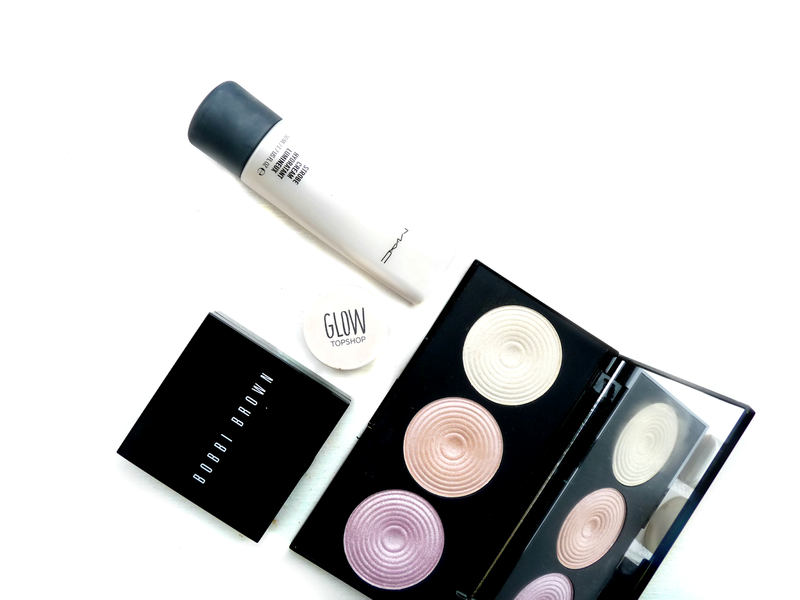 I have done a full review of Glow which you can read here, so definitely give it a read if you're looking for a product similar to Strobe Cream but for a fraction of the price. For anyone that wants to adopt the strobing trend but prefers a more natural glow, I'd recommend a product like Bobbi Brown's Shimmer Brick in Nectar. The shades inside this gorgeous compact are highlighters but they all have blush-like pink tones to them. Brush gently along your cheeks where you'd usually apply your blush to create the ultimate soft, rosy glow; a great alternative if you're looking for radiance without the harsh strobe. I love the Shimmer Bricks so much as you can either use each shade individually or just swish your brush in the compact to get a stunning combination of all of them. MAC Strobe cream is pretty wonderful stuff. It instantly makes my skin look ten times better. Helps to fake that glow no end! nooo!! I only just got the hang of contouring, and I can't even do that very well! I cannot keep up with these trends, seriously!! But I've always loved highlighting. I love the Topshop glow, but I just can't seem to get the hang of using it! I'm obsessed with strobing, I can't get enough of it! I love the MAC Strobe Cream, and I've added all of your other picks to my wishlist now, they all sound so lovely!